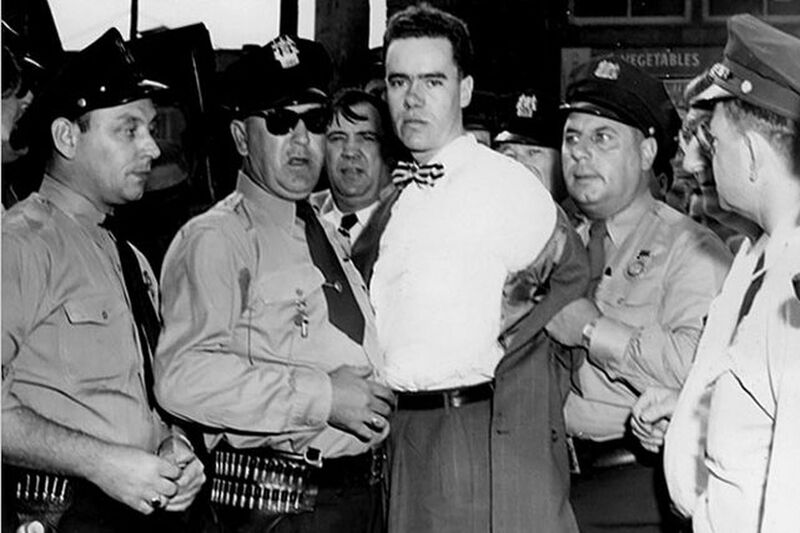 Howard Unruh is taken into custody after killing 13 and wounding 3 in Camden on Sept. 6, 1949. On Sept. 6, 1949, Howard Unruh, a 28-year-old World War II combat veteran, shot and killed 13 people, including three children, in a matter of minutes in his working-class neighborhood in Camden. The case against Unruh, who, unlike other spree killers, did not kill himself or get killed by police, appeared clear-cut. In a 48-page confession, given shortly after he was taken into custody — and while bleeding from a bullet wound to the buttock — Unruh provided a detailed account of how he walked on River Avenue the morning after Labor Day armed with a 9 mm Luger and a grudge, shooting both strangers and people he knew. He acknowledged he was aware that what he was doing was wrong, telling Camden County Prosecutor Mitchell Cohen he had considered killing his mother before going on his walk of death, to spare her the agony of what would follow. He said he expected to die in the electric chair. But, because of Cohen, Unruh never went to trial, and instead spent his remaining 60 years in a state mental hospital, a fate usually reserved for those found not guilty by reason of insanity. Charged with 13 counts of murder, Unruh never appeared in court to face them. He had no arraignment — this would be unheard of today — and, more important, no competency hearing to determine whether he understood the charges and could participate in his defense at a trial. Instead, Cohen had Unruh examined by a team of psychiatrists, who sometimes used truth serum — known as narcosynthesis and now considered unreliable because of patients' tendency to mix fact and fantasy — in their questioning. The prosecutor himself also interviewed Unruh. The psychiatrists discovered that Unruh was a deeply conflicted closeted homosexual who led a double life, seen as a Bible-thumping weirdo by his neighbors while making regular trips to Philadelphia to rendezvous with gay men in movie theaters or a room he secretly maintained in a boarding house. A month after the killings, four of the psychiatrists wrote to Cohen saying Unruh suffered from "Dementia Praecox, Mixed Type, with pronounced catatonic and paranoid coloring," and recommended he be committed to Trenton State Hospital. Cohen took that to mean that Unruh was insane. "Under the laws of this state, an insane person cannot be tried," Cohen announced. But that was not the case, and Unruh's criminal case disappeared down a legal wormhole. Insane people were and are tried all the time. Defense attorneys must make the case that their clients were so detached from reality that they were unaware of the nature of their actions. That's based on what is known as the M'Naghten Rule, established in 1843 in Britain and adapted by other legal systems. In The History of Forensic Psychiatry, Robert Sadoff notes, "New Jersey had adapted the narrow, 'right from wrong' M'Naghten test shortly after it was introduced in England and employed it consistently thereafter." In cases where an insanity defense appears imminent, hearings are often held to determine if the defendant is capable of standing trial. If not, the defendant is institutionalized until determined to be competent. Such was the case with accused Waffle House shooter Travis Reinking. A judge on Aug. 22 ordered the 29-year-old to be treated at a mental facility for schizophrenia in hopes that he becomes fit for trial. If Unruh's case had gone to trial, his attorney would likely have pursued an insanity defense. In that situation, a jury essentially would have had two options: guilty, which would have resulted in the death penalty or life in prison, or not guilty by reason of insanity, which would have led to his being institutionalized until a judge determined he was no longer a threat to society. In a broad exercise of prosecutorial discretion perhaps reflecting the times, Cohen essentially decided the killer was incapable of standing trial — a decision typically reserved for a judge. After that, no effort was made to determine if he could stand trial. Cohen, who became a federal judge and whose name adorns the U.S. courthouse in Camden, never explained why Unruh did not face a court hearing. Then again, no one appears to have asked him to. In an interview with the Camden Courier-Post marking the 25th anniversary of the massacre, Cohen recalled questioning Unruh immediately after the shooting: "What really convinced me he must be terribly insane was when he got up after two hours and his chair was covered in blood … considerable amount of it. He had been shot and wasn't even aware of it." He described Unruh as "cold, cut and dry." In an interview several years ago, Cohen's son, Fredric, a lawyer who was a boy at the time of the massacre, said he recalled his father, who died in 1991, calling the case "a new kind of situation" because of the number of victims and the fact that Unruh did not also die. "I remember him saying they were breaking new ground, and he accepted the finding that [Unruh] was insane and could not stand trial," Fredric Cohen said. The trial should be a full dress affair because the public has a stake in law and law enforcement and there are possibilities that the legal and psychiatric practitioners may learn from this unusual and interesting case. After all the evidence is in, let the court and jury find their verdict. I feel Unruh was not near enough unsound mentally to not understand what he was doing even if murders for revenge or hatred can be termed essentially a paranoid mechanism. On Oct. 29, 1949, Unruh's parents were summoned to court to sign off on a voluntary commitment of their son, a civil action. Judge Bartholomew Sheridan also directed Sam and Freda Unruh to pay $15 a week for his upkeep at Trenton State Hospital. It is not clear if Mitchell Cohen willingly ignored the law in not prosecuting Unruh or honestly believed the law prevented an insane person from being tried despite the long history of the M'Naghten test in New Jersey jurisprudence. Fredric Cohen, the prosecutor's son, said in a recent interview that he did not think his father — a "stickler" for details — ignored the law. "He was not the type of man who would violate standard procedures," he said. In the end, the survivors and the families of the victim's of the spree did not have to relive the trauma of the deadly day at a trial and the result was the same as if Unruh had been found not guilty by reason of insanity. When, finally, Unruh started receiving competency hearings due to an unrelated 1972 U.S. Supreme Court decision, no judge could find that he would not be a danger to himself or others outside of a mental-health institution.